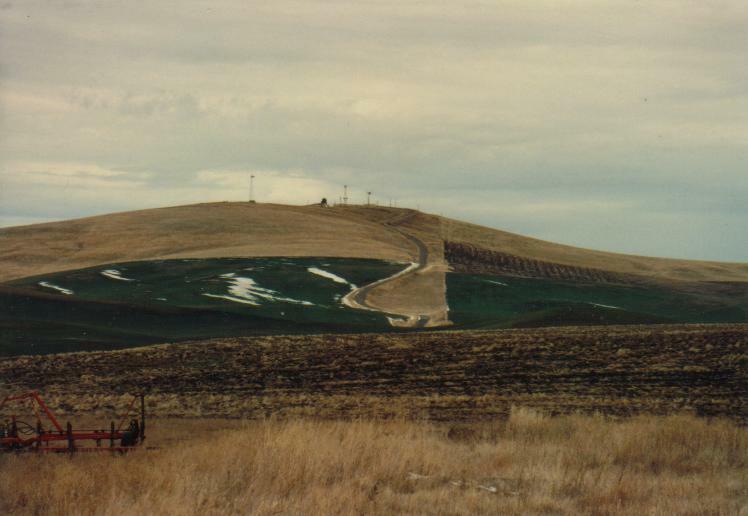 June 9, 1990: My first district time trial in Cheney, Washington...25 miles in heavy wind. My time of 1 hour 2 minutes 56 seconds was 59th of 64 riders, up to semi-pro. That thing on my back is a Camelback drinking system. I bought it in 1990 long before they were popular. The funny handlebars I'm stretched out on are the original aero-bars which are very popular now. I bought them in Japan in 1988 before any road cyclists had them, played with them, didn't feel stable on them and stuck them in my closet. Then the next year Greg LeMond won the Tour de France, riding the fastest time trail in the history of the Tour using the exact same bars. Suddenly everyone had them, so I pulled them out and tried to use them again. I was still unstable and wasn't able to successfully use them until 1994. I liked experimenting with new things but was rarely able to do it successfully. June 10, was the district road race of 40 miles. It started in heavy rain, I was immediately dropped by the peloton, got with a group of five stragglers who were going slower than I was, and we tried to catch the leaders together. Instead of breaking away I stayed with them and ended up bonking (running out of blood sugar) only to finish far down and only out sprinting two of the five riders at the finish. My introduction to U.S. cycling was a far cry from the success I had in Japan. I started to feel I was focusing too much on strategy and not enough on training and agressive riding. Strategy only works if you have strength to back it up. I'd lost my edge. I stopped racing and just enjoyed training hard. On July 3rd I did repeats on Booth Hill (above)...4700 feet long and rising over 420 feet. I'd discovered it from looking at geological maps in my office. It was so steep that if I didn't touch my brakes I'd be doing 52 miles an hour on just the last third of the descent. I was going so fast I had to slide off the back of the saddle for stability and lay on the brakes as hard as I could to stop before I hit the rough gravel trail at the bottom. It was the fastest I'd ever gone on a bicycle. After that I said to myself,"Okay...that's enough...I don't need to do that again!" The next day, on July 4th while riding at 27 miles an hour my front tire blew, locked against the front brake, and threw me over the front of the bicycle. It happened so fast I didn't know what happened. In an instant I was launched and slid 20 feet on my back until my helmet burrowed into the gravel. My knee was swollen, purple, and bleeding (along with other body parts) but I could still limp. My neck and back didn't feel too good either. My pedal hit the road shoulder so hard it had driven itself all the way into the ground and I thought it had been severred off. I immediately thought back to the previous day...what if this had happened at 52 miles an hour? After I resumed racing again, I was very nervous. In the first four races after the crashes, I narrowly missed a crash each time. It was like someone was trying to tell me to stop racing. I would be married in a few months and was thinking that maybe this sport was a little too dangerous for a married man with a wife waiting for him. Two weeks before Washington Trust Classic Stage race, a guy crashed in front of me again on the same course I'd crashed on myself...only this time he wasn't moving. He was face down with his arms limp at his side, and it was so severe they stopped the race. He was unconcious, broke a rib, collapsed his lung and broke his collar bone...something to do with his spleen too I think...my memory is rusty...a multitude of injuries. Ironically, he was a doctor. It looked pretty bad but he survived and was racing the next year. I, however, was a bit traumatized.